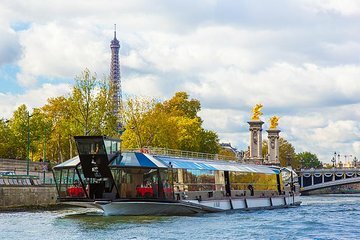 Concediti un elegante pranzo di 3 portate con vino in questa crociera sulla Senna del fiume che dura 2,5 ore. Mentre vi godete il vostro pasto preparato a bordo con ingredienti di provenienza locale, ammirate la Torre Eiffel, la Cattedrale di Notre Dame, il Grand Palais e altre attrazioni principali dal vostro tavolo di fronte alla riva del fiume patrimonio dell'umanità dell'UNESCO. Ascolta la musica tradizionale francese per fisarmonica e goditi più viste dal piano superiore all'aperto. Just a wonderful experience - and not to be missed. We did the lunch trip and realise should also have done the evening meal trip but just did not have the time. Absolutely Fabulous!!!! Food and music were top notch. The only disappointment was being seated for the first half hour in the broiling sun. We were finally moved and the rest of the cruise was wonderful. This was one of our first introductions on our holiday to tours. We thought it was very well organised and having a window seat fantastic. The live music is a nice touch. The food was of a very good quality. The tour was great. Food was excellent and the service was strong. All in all it was a great experience and a good value for the price. It included full, three-course lunch, a cocktail, and wine. I would recommend this tour.